The Universitat de Barcelona is a leading centre of education, science, and critical thought. Its commitment to serving the interests of local society and the country as a whole combines with its ascertainable dynamics, constructive and humanist character. As for the teaching, students are distributed across 67 Bachelor’s degrees, 141 university Masters’ degrees, 48 doctoral programmes, 654 postgraduate programs and over 600 lifelong learning courses. In the area of research, it is one of Spanish leading universities and it plays a predominant role in Spain’s scientific, technological, intellectual and cultural progress. It holds a place among the top 250 world universities, according to the THE ranking and is considered one of the best 200 universities in the world as reported by the ARWU ranking. Besides, it is the only Spanish member of the League of European Research Universities (LERU). The Chair management is guaranteed by its academic staff. The UB Faculty of Law and its Legal Environmental Clinic, as well as the UB Water Research Institute (IdRA) will support some of the teaching activities. 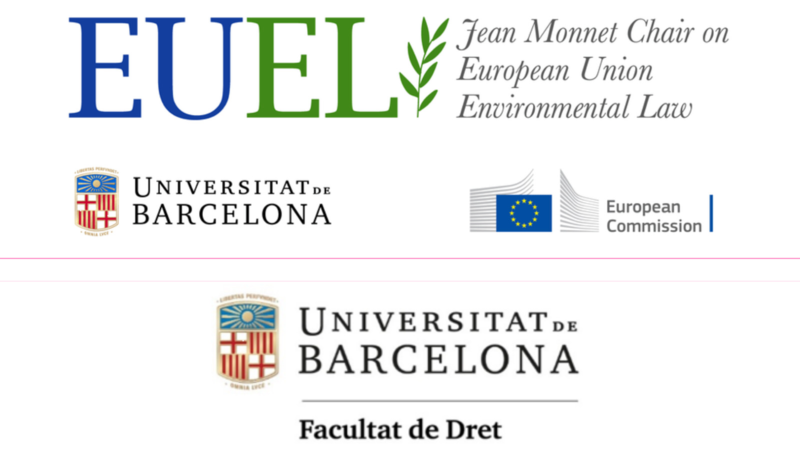 The Centre for Environmental Law Studies of Tarragona (CEDAT, Universitat Rovira i Virgili) brings its large experience as a think tank on Environmental Law research as well as in the organization of events related to the field covered by the Chair’s activities. Associate Professor (accreditated as Full Professor since 2010) of Public International Law and EU Law at UB. Main areas of teaching and research are EU Law and European and International Environmental Law, with a focus on climate change international regime. She has led and participated in various competitive research projects and published in these areas. Fulbright Scholar at American University WCL and visiting Professor at the Universities of Ottawa, Dalhousie, Montreal, Nova Southeastern and Puerto Rico. Member of the Consolidated Research Group “Area of International Public Law”, member of the UB IdRA’s Direction Board and of the CEDAT. Member of the Editorial Board of the Revista Catalana de Dret Ambiental. Vice Dean in the Faculty of Law (2002-2005 and 2016-present) and Vice Rector and Deputy Vice Rector for International Policy (2005-2008) at the UB. Full Professor of Public International Law and EU Law at UB. Dean of the Faculty of Law. Main areas of teaching and research are International Law, EU Law, International Organisations, Forest Law, and Fisheries Law. He has participated in various competitive research projects as leading researcher (funded by the Spanish Ministry of Economy and Competitiveness). He has been an international legal consultant for the FAO and has published numerous articles in specialized journals. At the University of Barcelona he has held management positions as Vice President (2001-2002), President of the Social, Economic and Legal Sciences Division (2002-2003), General Secretary of the University (2005-2008) and Dean (since 2016). Associate Professor of Public International Law and International Trade Law at UB. Certificate of the Centre for Studies and Research of the Hague Academy of International Law. Main areas of teaching and research are Public International Law and International Economic Law. He has participated in various national and international competitive research projects in these areas. Member of the Consolidated Research Group “Area of Public International Law”. He participates in the UB Observatory of Globalization. Member of the CEDAT. Visiting Professor at the Universities of National University of Nicaragua, Puerto Rico, FLACSO, São Paulo and the Doctoral School on Latin American, European and Comparative Regionalism (UNU). Co-Director of the UB Master of Laws in International Economic Law and Policy since 2016 and academic supervisor at the TradeLab Clinic Network (GIIDS of Geneva). Associate Professor of Administrative Law at the UB. Main areas of teaching and research are Environmental law, Public Interest Law Litigation and Local Government. He has led and participated in various competitive research projects and published in these areas. He was an associate researcher at Harvard University in USA. Member of the Consolidated Research Group “Area of Administrative Law”, the UB Public Law Institute and of the Observatory of Environmental Policies (OPA), where he is responsible for “access to justice in environmental matters”. Member of the editorial board (section Suprem Court Case Law) in the Revista de Administración Pública. Coordinator of Administrative Law Area (2015-2016), secretary of the Administrative Law section (2016-present) and coordinator of the Environmental Law Clinic at the UB (2013-present). Associate Professor of Constitutional Law at the UB. Main areas of teaching and research are Constitutional Law, Rights and Freedoms and Spanish Environmental Law. Member of various competitive research projects in these areas and published related papers. She holds an LLM from Columbia Law School (NYC) and has been a visiting researcher and scholar at Harvard Law School (Cambridge) and at the European University Institute (Florence). Since 2008 she is also a visiting constitutional professor at the University of Lyon 2. She is a board member and consultant at the Environmental Law Fund (Barcelona). She has a broad experience as international observer and legal analyst at the European Union Electoral Observation Missions. She has worked as an environmental lawyer for two international law firms (Balaña Eguia-Loeff Claeys Verbeke (Barcelona) and Torres Plaz Araujo (Venezuela). Full Professor of Public International Law at URV. Dean of the Faculty of Law. Member of the Governing Council of the International Catalan Institute for Peace. Director of the Tarragona Centre for Environmental Law Studies (CEDAT). Coordinator of the “Territory, Citizenship and Sustainability” Consolidated Research Group. Main researcher in various projects funded under competitive calls by regional, national and European authorities. Member of the European Environmental Law Forum Advisory Board and of the Advisory Board of the Network on Business, Conflict and Human Rights. He has participated in numerous national and international conferences and has given lectures, courses and seminars. He has coordinated numerous academic activities, including the VII National Environmental Law Conference (Tarragona, 2009) and the XII Colloquium of the IUCN Academy of Environmental Law (Tarragona, 2014). Senior Lecturer of Public International Law at URV. Main areas of teaching and research are Public International Law and International and EU Environmental Law. She has participated in various national and international competitive research projects in these areas. Member of the Consolidated Research Group on “Environmental Law, Immigration and Local Government” (CEDAT). Research fellow at Committee on Challenges of Modern Society (NATO/CCMS). Visiting researcher at Max Planck Institut für ausländisches öffentliches Recht und Völkerrecht, Center of International Environmental Law in Washington and Centre de Recherche at The Hague Academy of International Law and International Relations. Visiting Professor at Universities Federal de Santa Catarina, Estadual de Londrina, Pontificia Universidade Católica de Paraná and Autonoma de Bucaramanga. Member of the IUCN Academy of Environmental Law and the European Society of International Law. 2016 NOGUEIRA, A., BORRÁS, S. GILES, R., JARIA, J., “Marco general. El medio ambiente en los tiempos de la globalización neoliberal”, en SANZ LARRUGA, F. JAVIER (Coordinador), Derecho ambiental para una economía verde. Informe RED ECOVER, Editorial: Aranzadi, ISBN: 978-84-9098-906-7, Páginas: 394, 2016. Edición: 1ª ed. 2016 JARIA I MANZANO, J., CARDESA-SALZMANN, A., PIGRAU, A., BORRÀS, S., “Measuring environmental injustice: how ecological debt defines a radical change in the international legal system”, en Alf Hornborg and Joan Martinez-Alier (eds.) 2016. “Ecologically unequal exchange and ecological debt”, Special Section of the Journal of Political Ecology 23: 328. 2016 BORRAS, S., Chapter 10: “Rights of Nature to Protect Human Rights in Times of Environmental Crisis” (pages 225-261), en Defending Human Rights and Democracy in the Era of Globalization, edited by Christina Akrivopoulou. Hellenic Open University, Greece) ISBN13: 9781522507239; ISBN10: 152250723X; EISBN13: 9781522507246. 2016 BORRAS, S., “Ciudades y cambio climático: responsabilidades, retos y oportunidades”, Revista de la Fundación Democracia y Gobierno Local, n. 33. 2016 BORRAS, S., “El deber de cuidado de los Estados frente a los desafíos del cambio climático”, Diálogo Ambiental, Constitucional e Internacional / Jorge Miranda, Carla Amado Gomes, Coordenadores; Bleine Queiroz Caúla, … [ et al.] – 1. ed. – Rio de Janeiro: Lumen Juris, 2016. ISBN 978-85-8440-545-9, pp. 19-52. 2016 BORRAS, S., “Migration with dignity for climate justice: the situation of small island developing states”, Chapter 19, VV. AA., The Common Good and Ecological Integrity: Human Rights and the Support of Life, editado por Laura Westra, Janice Gray, Antonio D’Aloia, Routledge (May 26, 2016) ISBN-13: 978-1138668225, ISBN-10: 1138668222, pp. 239-254. 2016 BORRAS, S., VILLAVICENCIO, P., “Chapter 3: Urban Realities and Urban Sustainable Development Goals in the 21rst Century: Transforming our cities for (all) people and the Planet?, in Sancin, V., Kovic, M (Ed. ), International Environmental Law: Greening the Urban Living, University of Ljubljana, ISBN978-961-6447-61-4, pp. 55-69. 2016 BORRAS, S., “La migración ambiental: entre el abandono, el refugio y la protección internacional”, Revista Papeles sobre migraciones forzadas, 2016. Revista Papeles de relaciones ecosociales y cambio global (nº132), 2016. 2015 BORRAS, S., “El coste humano de la degradación del medio ambiente: la migración ambiental”, Revista del Instituto Brasileiro de Direitos Humanos, Año 15, vol. 15. N. 15, 2015, ISSN 1677-1419, pp. 351-366. 2015 BORRAS, S., “New Transitions From Human Rights to the Environment to the Rights of Nature”, Transnational Envitonmental Law (TEL), Cambridge University Press. Volume 5 / Issue 01 / April 2016, pp 113-143. 2015 TEL obtained a strong first Impact Factor of 0.559, placing it 3rd highest environmental law journal and 79th out of 140 law journals on the Thomson Reuters JCR. It also placed 3rd highest environmental law journal and in the top quartile of law journals on the Scopus SCImago rankings. 2015 BORRAS, S., “Del paradigma de desarrollo sostenible a la construcción de la justicia ambiental internacional: la sostenibilidad justa”, PAVIA DE TOLEDO, A. (Org. ), Direito internacional & desenvolvimento sustentável, editora DPlácido. Brasil, 2015, ISBN. 9788584251568. 2015 BORRAS, S., “Construyendo el principio de responsabilidad de proteger para fortalecer la seguridad climática”, jan-jul de 2015, año 6, pp. 84-100, Revista de Direito Brasileira-RDB, ISSN 2237-583X. 2015 BORRAS, S., “Perspectiva del derecho internacional del medio ambiente”,REVISTA CATALANA DE DRET AMBIENTAL Vol. VI Núm. 2 (2015): 1 -17. 2015 BORRAS, S., “La Migración con dignidad para la justicia climática: la situación de los pequeños Estados Insulares en Desarrollo”, edited by Antonio Augusto Cançado Trindade, César Barros Leal, El respeto a la dignidad de la persona humana, 07/2015: chapter: pages 237-266; Bairro Cocó (Brasil): Instituto Brasileiro de Direitos Humanos (IBDH), ISBN: 978-85-420-0652-0. 2015 Borràs, S., Vilaseca, I., “Los conflictos ambientales causados por empresas transnacionales: realidades y retos jurídicos internacionales”, en BORRAS, S., ANNONI, D., Retos internacionales de la protección de los derechos humanos y el medio ambiente, GEDAI/UFPR, ISBN: 978-85-67141-12-1, Brasil, Enero 2015. 2015 BORRAS, S., ANNONI, D., Retos internacionales de la protección de los derechos humanos y el medio ambiente, GEDAI/UFPR, ISBN: 978-85-67141-12-1, Brasil, Enero 2015. 2015 BORRAS, S., “La contribución de la Corte Interamericana de Derechos Humanos en la protección de los defensores ambientales”, Eunomía. Revista en cultura de la legalidad, vol. 9. 2015 BORRAS, S. / PIGRAU, A., “Environmental Defenders: The Green Peaceful Resistance”, in Ecological Systems Integrity. Governance, law and human rights. Edited by Laura Westra, Janice Gray, Vasiliki Karageorgou. Routledge, 2015, pp.256-271. ISBN: 978-1-13-888510-3. 2015 Borràs, S., “De la deslocalización de emisiones de gases de efecto invernadero: La incidencia de la política de biocombustibles de la UE en el cambio de uso indirecto de la tierra (ILUCs)”, Revista Peruana de Energía N° 5, “Energía y Cambio Climático”, ISSN: 2307-0870, pp. 173-205. 2014 Borràs, S., “Del derecho humano a un medio ambiente sano al reconocimiento de los derechos de la naturaleza”, en R.V.A.P. núm. 99-100. Mayo-Diciembre 2014, Vol. I. Págs. 649-680, ISSN: 0211-9560. 2015 ­­­­­­ Borràs, S., “Retos de la política ambiental de la UE hasta 2020: ¿“vivir bien, respetando los límites de nuestro planeta”?, en Revista General de Derecho Europeo, número 35 (2015). 2015 ­BORRÀS, S., “La responsabilidad soberana para fortalecer la seguridad climática”, en DeTomás Morales, S. (Dir.) Retos del derecho ante las nuevas amenazas, Editorial Dykinson, Madrid, 2015, pp. 327-349. ISBN: 978-84-9085-257-6. 2014 Borràs, S., “De la discriminación ambiental a la construcción de la justicia ambiental”, “IGUALDADE E NÃO DISCRIMINAÇÃO .en TRINDADE, Antônio Augusto Cançado; LEAL, Cesar Barros. Igualdad y no discriminación. Fortaleza: IBDH/IIDH/SLADI, ISBN: 978-85-420-0435-9, 2014, pp. 205- 258. 2014 Borràs, S., “El reconocimiento legal de los derechos de la naturaleza en Bolivia”, en Lívia Gaigher Bósio Campello, Maria Claudia da Silva Antunes de Souza e Norma Sueli Padilha (organizadoras), Direito Ambiental no Século XXI: Efetividade e Desafios, Volume III, Editora Arraes, Belo Horizonte, 2014 ISBN: 978-85-8238-085-7, pp. 311-334. 2014 Borràs, S., “Los retos de transformación del Máster universitario en derecho ambiental en la URV: virtualizar la docencia para enseñar a aprender”, ed. Huygens, Barcelona. 2014 PIGRAU, A., BORRAS, S., (Dir. ), Derecho internacional y comparado del medio ambiente: temas actuales, ed. Huygens, Barcelona. 2014 PIGRAU, A., BORRAS, S., CARDESA-SALZMANN, A., JARIA, J., International law and ecological debt. International claims, debates and struggles for environmental justice, EJOLT Report n. 11. 2014 Borràs, S., “La protección del derecho a defender el medio ambiente”, en Coleçao Direito Internacional Multifacetado. Direitos Humanos, Meio Ambiente e Segurança, Vol II, Juruá Editora, Curitiba, 2014, ISBN: 978-85-362-4783-0. 2014 Borràs, S., “Análisis de la contribución del paradigma de desarrollo sostenible a la justicia ambiental, económica y social”, Diálogo Ambiental, Constitucional e Internacional, Editora Premius, FORTALEZA (BRASIL), ISBN: 978-85-7924- 318-9. 2014 Borràs, S., Vilaseca, I., “Capítulo 7. Los conflictos ambientales causados por empresas transnacionales: realidades y retos jurídicos internacionales”, en Ricardo Soares Stersi dos Santos, Danielle Annoni, (Organizadores), Cooperação e Conflitos Internacionais: Globalização, Regionalismo e Atores, ed. Multideia, CAPES/PROEX/PPGD,Curitiba, 2014, pp. 137-172. 2013 Borràs Pentinat, S.; OLIVEIRA DO PRADO, Rafael Clemente. A proteção jurídica internacional dos deslocamentos humanos forçados por causas ambientais. In: BÓSIO CAMPELLO, Lívia Gaigher; ANTUNES DE SOUZA, Maria Cláudia da Silva; PADILHA, Norma Sueli (Coord.). Direito Ambiental no Século XXI: Efetividade e Desafios, vol. 2. Curitiba: Editora Clássica, 2013, p. 325-354. ISBN 978-85-99651-78-0. 2013 Borràs Pentinat, S., “El derecho a defender el medio ambiente: la protección de los defensores y defensoras ambientales”, en Revista Peruana de Derecho Ambiental, N. 70, 2013, ISSN: 0251-3420, pp. 291-324. 2013 Borràs Pentinat, S. (Dir. ), Retos y Realidades de la adaptación al cambio climático. Perspectivas técnico-jurídicas, Thomson Reuters, Aranzadi, ISBN: 978-84-9014-837-2. 2013 Borràs Pentinat, S., “La adaptación al cambio climático en la Unión Europea”, en Borràs Pentinat, S. (Dir. ), Retos y Realidades de la adaptación al cambio climático. Perspectivas técnico-jurídicas, Thomson Reuters, Aranzadi, ISBN: 978-84-9014-837-2, pp. 167-194. 2013 “La protección de los pueblos indígenas a través de la protección del medio ambiente “en “Direitos Humanos e Desenvolvimento Sustentável” coordinado por los profesores de la UEMS, Gabriel L. B. Vidrih Ferreira e Alessandro M. Prado, Editora UEMS, Brasil. 2013 Borràs Pentinat, S., ¿Apariencias o realidades? El control internacional de los tratados multilaterales de protección del medio ambiente, Tirant lo Blanch, ISBN: 978-84-9033-262-7, pp. 1-726. 2013 Borràs Pentinat, S., “Pueblos indígenas y medio ambiente”, VV.AA., Pueblos indígenas y medio ambiente en las nuevas constituciones de Ecuador y Bolivia, ed. Tirant lo Blanch, ISBN: 978-84-9033-130-9, pp. 111-146. 2013 Borràs Pentinat, S., Pigrau Solé, A., “Medio ambiente y derechos de los pueblos indígenas en el Sistema Interamericano de Derechos Humanos”, VV.AA., Pueblos indígenas y medio ambiente en las nuevas constituciones de Ecuador y Bolivia, ed. Tirant lo Blanch, ISBN: 978-84-9033-130-9, pp.147-210. 2013 Borràs Pentinat, S., “Perspectiva del Derecho Internacional del Medio Ambiente”, in Revista Catalana de Dret Ambiental, Vol. 4, Núm. 1 (2013), http://rcda.cedat.cat/index.php/rcda. 2013 BORRAS, S., “La justicia climática: entre la tutela y la fiscalización de las responsabilidades”, Anuario Mexicano de Derecho Internacional, volumen XIII, ISSN 1870-4654, http://biblio.juridicas.unam.mx/revista/DerechoInternacional/. 2012 Borràs Pentinat, S., “The urban governance of climate change: local responses to global challenges”, en VV.AA., Heritage, Environment and Society: new spatial challenges, PROURB/UFRJ, ISBN:978-85-88027-27-5, pp. 45-76 y 251-276. 2012 PIGRAU, A., BORRÂS, S., JARIA, J., CARDESA, A., Legal venues for EJOs to Claim Environmental liability, EJOLT REPORT N. 4, VII Programa Marco de la Unión Europea. Programa “Science in Society Part 5” (FP7-SCIENCE-IN-SOCIETY-2010-1. GRANT NUMBER 266642). The report is available at: http://www.ejolt.org/2012/05/legal-avenues-for-ejos-to-claim-environmental-liability/, pp. 1-96. 2012 BORRAS, S., “Los litigios climáticos: entre la tutela climática y la fiscalización de las responsabilidades por daños climáticos”, Cambio Climático, Energía y Derecho Internacional, Thomson-Aranzadi. 2012 Borràs Pentinat, S., “El derecho a un medio ambiente en el sistema Interamericano de protección de los derechos humanos”, en Annoni, A. (Organizadora), Directo Internacional dos direitos humanos. Homenagem à Convenção Americana de Direitos Humanos, ed. Grupo Conceito, Sao Paulo, 2012, ISBN: 978-85-7874-270-6, pp. 223-256. 2012 Borràs Pentinat, S., “Perspectiva del Derecho Internacional del Medio Ambiente”, in Revista Catalana de Dret Ambiental, Vol. 3, Núm. 2 (2012), http://rcda.cedat.cat/index.php/rcda. 2012 Borràs Pentinat, S., “Perspectiva del Derecho Internacional del Medio Ambiente”, in Revista Catalana de Dret Ambiental, Vol. 3, Núm. 1 (2012), http://rcda.cedat.cat/index.php/rcda. 2012 Borràs, S. (CEDAT, Universitat Rovira i Virgili), 2012. The Persecution and Violation of Human Rights of Environmental Defenders, EJOLT Factsheet No. 48, 10 p. Avaiable at: http://www.ejolt.org/wordpress/wp-content/uploads/2015/08/FS-48.pdf. Pons Rafols,X.-Campins Eritja,M.-Castellà Andreu,J.M.-Martín Nuñez,E. (2012), La acción exterior y europea de la Generalitat de Cataluña. Desarrollo normativo e institucional, Ed. Marcial Pons, ISBN 978-84-9768-742-3, Barcelona. Campins Eritja, M.(2005), La Constitución Europea: Entre lo intergubernamental y lo supranacional, Edicions i Publicacions de la Universitat de Barcelona, Barcelona, ISBN: 84-475-2883-9. Campins Eritja, M. «The European Union and the North: Towards the Development of an EU Arctic Policy? (2013) Vol. 27 Ocean Yearbook 459. Campins Eritja, M. “Cultures d’OGM dans un marché unique : Système d’autorisation centralisé versus choix des États membres »,(2012) Vol. 17, nº 1 Lex Electronica 1 (online). Campins Eritja, M., “Un nuevo paso en la dirección correcta: La firma por la Unión Europea del Protocolo relativo a la gestión integrada de las zonas costeras del Mediterráneo”, (2011), 24 Revista General de Derecho Europeo 1 (online). Campins Eritja, M., “Las entidades sub-nacionales en Norteamérica y la lucha contra el cambio climático: Desarrollo normativo y vinculación de sistemas de comercio de derechos de emisión” (2011), 2 Revista Catalana de Dret Ambiental 1 (online). Campins Eritja, M. “Los retos de la cooperación regional en Asia Central: Más sombras que luces en la gestión de los recursos hídricos compartidos” (2010), 20 Revista Electrónica de Estudios Internacionales 1 (online). Campins Eritja, M., “La gestión de los cursos de agua internacionales en Asia Central ¿amenaza u oportunidad?” (2009), 65 ARI-Boletín del Real Instituto Elcano 15. Campins Eritja, M., “El mecanismo de cumplimiento del Protocolo de Kyoto. Un nuevo paso en aras al control del cumplimiento de los acuerdos internacionales” (2007), 14 Revista Electrónica de Estudios Internacionales 1 (online). Campins Eritja, M., “Comentario a la Sentencia de 13 de septiembre de 2005, Asunto C-176/03, Comisión de las Comunidades Europeas contra Consejo de la Unión Europea” (2006), 1 Revista Jurídica de Catalunya 276. Campins Eritja, M., “La Decisión Marco 2005/667/JAI del Consejo, destinada a reforzar el marco penal para la represión de la contaminación procedente de buques y la coexistencia entre el primer y el tercer pilar del TUE” (2006), 9 Revista General de Derecho Europeo 1. Campins Eritja,M.-Fernández Pons,X.-Huici Sancho,L., “Compliance Mechanisms in the Framework Convention on Climate Change and in the Kioto Protocol: Constitutive Elements and Challenges ahead from an European Perspective” (2004), 34 Revue Général de Droit 51. Campins Eritja, M., “El reconeixement de la diversitat lingüística a la Carta dels Drets Fonamentals de la Unió Europea” (2002), 38 Revista de Llengua i Dret 95. Campins Eritja,M.-Gupta,J., “Non-State Actors and Sustainability labelling Schemes: Implications for International Law” (2002), 2 Non-State Actors and International Law 213. Campins Eritja,M., “La aplicación del derecho comunitario ambiental en España” (2001), 205 Noticias de la Unión Europea 9. Campins Eritja,M.-Olesti Rayo,A., “Las nuevas adhesiones a la Unión Europea de los países de Europa Central y Oriental: La estrategia de adhesión y sus implicaciones en el ámbito de la política comunitaria ambiental / The New Accessions to the European Union from the Central and Eastern European Countries: The Strategy of Accession and its Implications on the Environmental European Policy” (2000) 6 ILSA Journal of International & Comparative Law 613. Campins, M. (2017) “Strengthening the European Union Greenland’s Relationship for an Enhanced Governance of the Arctic”, in Liu, N.; Kirk, E.; Churchill, R.; and Henriksen, T., (Ed. ), The European Union and the Arctic, Brill Academic Publishers, Leiden. Campins, M. (2015), ”La protección del medio ambiente en el seno de las Naciones Unidas” in Pons Rafols, X. (Ed. ), Las Naciones Unidas desde España., Associación para las Naciones Unidas en España – Ministerio de Asuntos Exteriores, Madrid, 309. Campins Eritja, M.(2014), ”Part B.Section III: A Subregional Framework for Transboundary Water Management and the Role of the European Union into the Region’, in Campins Eritja. M.- Mañé Estrada, A. (Eds. ), Building a Regional Framework in Central Asia: Between Cooperation and Conflict, ICIP Research 02, ICIP, Barcelona, 41. Campins Eritja, M., (2013) ”El principio de precaución como base de la normativa de la Unión Europea relativa a los nuevos alimentos y nuevos ingredients alimentarios” in Pons Rafols, X. (Dir. ), Salud humana y seguridad alimentaria: elementos de cooperación internacional, Ed. Marcial Pons, Madrid, 376. Campins Eritja, M.-Pigrau Sole, A., (2012) « Chapter 50: Environmental Law of Spain », in Robinson, N.- Heng Lye, L.- Burleson, E. (Eds. ), Comparative Environmental Law and Regulation, Thomson Reuters – West, Vol. 3, 1. Campins Eritja, M. (2010), ‘La gobernanza internacional del medio ambiente’, in Sindico, F.-Fernández Egea, R.M.-Borrás Pentinat, S. (Ed. ), Derecho Internacional del Medio Ambiente: Una visión desde Iberoamérica, CMP Publishing, United Kingdom, 128. Campins Eritja, M. (2010), “La Unión Europea y la protección de la salud pública”, in Pons Rafols, X. (Ed. ), Salud pública mundial y derecho internacional, Ed. Marcial Pons, Madrid, 376. Campins Eritja, M. (2009), “Las medidas de vigilancia y control epidemiológico en la Unión Europea”, in Badia Martí,A.-Pigrau Solé,A.-Olesti Rayo,A. (Coord. ), Derecho internacional y comunitario ante los retos de nuestro tiempo. Homenaje a la Profesora Victoria Abellán Honrubia, Vol. II: La Unión Europea ante los retos de nuestro tiempo, Editorial Marcial Pons, Barcelona, 921. Campins Eritja, M. (2009), ‘Algunas reflexiones en torno al cumplimiento de las obligaciones derivadas de la Directiva 2003/87/CE por la que se establece un régimen de comercio de los derechos de emisión de los gases de efecto invernadero en la Comunidad Europea’, in Remiro Brotons, A.-Fernández Egea, R.M. (Ed. ), El cambio climático en el derecho internacional y comunitario, Fundación BBVA, Madrid, 165. Pigrau Solé, A. – Campins Eritja, M. (2008), «La protección del medio ambiente a través del Derecho penal en la Unión Europea, a propósito de la Decisión marco 2003/80/JAI del Consejo, de 27 de enero de 2003 y de su anulación: Una visión desde el Derecho internacional”, in Quintero Olivares,G.-Morales Prats,F (Eds. ), Estudios de Derecho Ambiental. Libro Homenaje al profesor Josep Miquel Prats Canut, Editorial Tirant Lo Blanch, Valencia, 229. Campins Eritja, M. (2007), “Algunas reflexiones en torno a la aplicación de los sistemas de estandarización de la sostenibilidad”, in Sustainable Development and International Law: The Way Forward, EUI Working Papers, LAW2007/28, European University Institute, San Domenico di Fiesole, 81. Campins Eritja, M. (2007), “Traslado transfronterizo de residuos peligrosos: EL Convenio de Basilea sobre control de los movimientos transfronterizos de desechos peligrosos”, in Lozano, B. (Ed. ), Diccionario de Derecho Ambiental, Editorial Iustel, Madrid, 1286. Campins Eritja, M. (2006), “Reviewing the challenging task faced by Member States in implementing the Emissions Trading Directive: Issues of Member States Liability”, in Deketelaere, K. – Peters, M. (Eds. ), EU Climate Change Policy: The Challenge of Implementing New Regulatory Initiatives, Edwarg Elgar Publishing, Cheltenham, 69. Campins Eritja, M. (2006), “The European Community Ecolabelling Scheme”, in Macrory. R. (Ed. ), Reflections on 30 Years of European Community Environmental Law: A High Level of Protection?, Europa Law Publishing, Groningen, 109. Campins Eritja, M.- Huci Sancho, L. (2005), « La Comunidad Europea y el régimen del cambio climático”, in Campins Eritja, M. (Ed. ), Los retos de la aplicación del Protocolo de Kyoto en España y Canadá, Atelier, Barcelona, 41. Pont Castejon,I.-Campins Eritja,M. (2005), “Els aspects legals de la lluita contra el canvi climatic”, in Llebot,E. (Dir. ), Informe sobre el canvi climatic a Catalunya (Report: Climate change in Catalonia), Instituts d’Estudis Catalans – CADS, Barcelona, 677. Campins Eritja,M.-Gupta,J. (2004), “The Role of Sustainability Labelling in the International Law of Sustainable Development”, in Shrijver,N.-Weiss,F. (Eds. ), International Law and Sustainable Development. Principles and Practice, Martinus Nijhoff Publishers, The Netherlands, 251. Pigrau Soler,A.-Campins Eritja,M.-Borràs Pentinat,S. (2004), “La adopción de una perspectiva integrada en la política comunitaria ambiental: La directiva 96/91/CE relativa a la prevención y al control integrados de la contaminación”, in Vernet,J.-Baucells,J. (Coord. ), La prevención y el control integral de la contaminación (Pollution Prevention and Integrated Control), Editorial Marcial Pons, Madrid, 18. Campins Eritja,M. (2001), “El Acuerdo complementario de cooperación ambiental de América del Norte y la participación de Canadá”, in Mitjans,E.-Castellá,J.M. (Coord. ), Canadá: Introducción al sistema político y jurídico (Canada: Introduction to political and legal system), Publicacions de la Universitat de Barcelona, Barcelona ,375. Campins Eritja,M. (2000), “La unidad institucional en el Tratado de Amsterdam”, in: Olesti, A., (Coord. ), Las incertidumbres de la Unión Europea después del Tratado de Ámsterdam, J.M. Bosch Editores, Barcelona, 107. Campins Eritja, M. (Ed. ), Los retos de la aplicación del Protocolo de Kyoto en España y Canadá (2005), Atelier, Barcelona. Campins Eritja, M. (Ed.) Sustainability Labelling and Certification (2004), Editorial Marcial Pons, Madrid. Abellán Honrubia,V.-Vila Costa,B.-Pinol Rull,J.Ll. (Dir. ), Campins Eritja,M. (Coord. ), Prácticas de Derecho Comunitario Europeo (2003), Editorial Tecnos, Madrid. Campins Eritja, M.- Requena Hidalgo,J. (Coord. ), De las catástrofes ambientales a la cotidianeidad urbana: La gestión de la seguridad y el riesgo (2000), Publicacions Universitat de Barcelona, Barcelona. Campins Eritja,M.- Pont Castejón,I. (Coord. ), Perspectives de Dret Ambiental Comunitari (1997) Institut Universitari d’Estudis Europeus, Bellaterra.